Best Concussion Treatment is to rest from all physical and mental activities. Concussion is a very serious head injury that should be taken most seriously. Seeing a Doctor is the best way to fully diagnose any head injury. Due to brain injury being in question, it is crucial that the correct injury assessment is done by a professional. Following head concussion, resting both mentally and physically is the best concussion treatment for athletes. Watching TV, playing videogames, using the computer, texting etc... is considered mental activity, and is not good for treating a head concussion. Using Acetaminophen (Tylenol) can help with relieving headache pain. Avoid the use of pain relievers such are Iboprofen, Advil, Motrin and Aspirin, because these medications increase the risk of blood vessels bleeding. 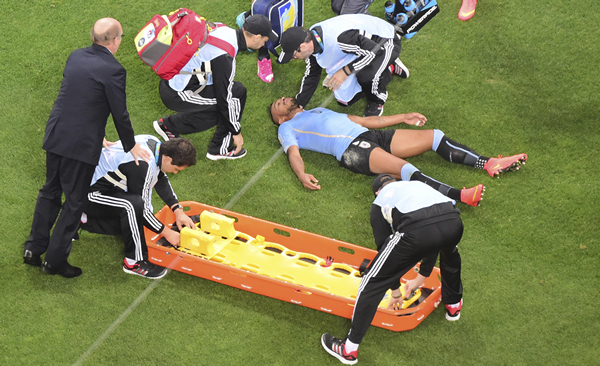 If the concussion is suffered while playing competitive sport such is soccer, Doctor should be the one and only person to clear the player for a safe return to competitive sport, following treatment for head concussion. Ignoring concussion injury, and returning to competitive sports too fast, may cause more harm in the long run; risking more head concussions and potential fatal brain injury. In other words, an athlete should never return to playing while signs or symptoms of concussion are present, but instead treatment should be done towards full recovery, before athlete can return to playing. Any suspected head injury needs to be evaluated by a medical professional simply because the injury may be much more severe, even if it feels like a minor injury to the athlete. Any sort of head bang or whiplash needs to be treated with absolutely no activity, as any additional head injury or whiplash may lead to a more serious head injury, and potential death. Pain, nausea, dizziness or any abnormal symptom should lead to an immediate medical exam. Worsening symptoms such are headaches, nausea, vomiting or sleepiness should lead to an immediate call and visit to doctors office. Calling 911 emergency response is a must in situations where there is noticeable weakness in one side of the body, pupils that don't react the same way to the light (one stays more dilated than the other), slurred speech, dragging one foot when attempting to walk or drooping on one corner of the mouth or eyelid. These symptoms point towards a more severe head concussion, and medical help needs to be the priority in the first step of treatment. Concussion recovery is simply done by resting as much as possible from both, mental and physical activities. Rest, Rest, followed by more Rest. Seeing a doctor to fully asses the head injury is very important. The brain is the most important organ in our body, and any injury to the brain has the potential for prolonged recovery and potentially death. Taking the time to fully recover from any concussion is a MUST. DO NOT return to playing sports until there are no side effects of concussion present. SEE A DOCTOR - BRAIN INJURY IS NO JOKE!! !